Notice, and am gratified by, large clump of crocuses near the front gate. Should like to make whimsical and charming reference to these and try to fancy myself as 'Elizabeth of the German Garden', but am interrupted by Cook, saying that the Fish is here, but he's only bought cod and haddock, and the haddock doesn't smell any too fresh, so what about cod? Have often noticed that Life is like that. First published in 1930, this charming, funny book is a warm portrait of a middle-class English family and their village life. Our heroine recounts the mundane delights and disasters of her household: dealing with constant money worries, the challenges of finding & keeping a really good parlourmaid, and how best to retain grace towards her fellow humans in the face of their astonishing range of foibles. It's also a wonderfully genuine description of a marriage, with all the little ups and downs of rubbing along with the same person for so many years. 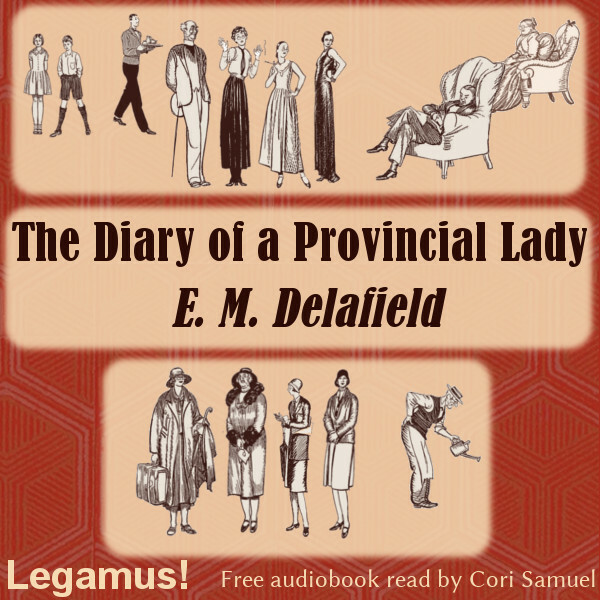 [Section number] of The Diary of a Provincial Lady by E. M. Delafield. This Legamus recording may be distributed and adapted freely for any purpose. 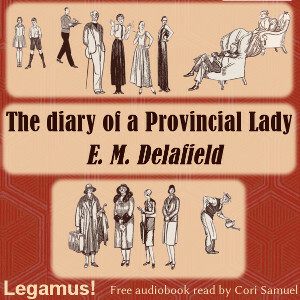 "End of The Diary of a Provincial Lady by E. M. Delafield. For more information or to volunteer, please visit Legamus.eu"
It's in a diary format, of course, so I've tried to create sections of about half an hour each, so the whole thing will be about 6 hours long. It's all recorded, so you won't have long waits for each file, wondering what happens next. The first chapter is already uploaded, too. I am going to MC it myself, and hopefully not mess anything up while doing so. If you'd like me to DPL, I'd be quite willing. As we've not worked together before, I'll let you know what you're in for! A specific thing - I'll be away from my desk in late April and early May, which I mention just in case you'd like the project to be catalogued quickly. General stuff: if I have a text to work from I read along as I PL. I'm absolutely fine doing standard PL, word perfect PL or what I do for most of the readers I PL for, which is to note things that change the meaning. If you would like to make any changes that would be up to you (and most of these wouldn't be noted in standard PL), but it tends to be things such as a proper name, a noticeable mispronunciation, the addition or omission of 'no' or 'not' and things along those lines. I can dial the pedantry up or down as you wish, and of course every new collaboration is a learning process! Section 1 is fab. I've marked it PL OK, although I'll note one small thing - the intro omits 'Legamus'. I think there is slightly greater flexibility with the disclaimers here than at Librivox, though I'm willing to be corrected on that point! What a fun chapter. I am sorry that I'll never get to read (or record!) Symphony in Three Sexes! Section 2 is very good, and I'm so glad that you've introduced me to Delafield. I have a couple of PL notes. This is an opportunity to work on what level of PLing you'd like. If these are too stringent, do say so. I don't want you to wince whenever I post in the thread. ...and approach subject of burnt porridge circuitously and with utmost care. I completely understand that knowing how to pronounce a word and having that come out of your mouth when the mic is recording are two different things. There are a couple of words I look up every single time I prep a section to record, even though I really don't need to by now. I know them, but the wrong thing is just lodged deep in some primitive part of my brain. The plot continues apace. I don't know what Robert will say to her when she gets back from London! Sections 4 and 5 are PL OK. I have one note for section 3, and, as with everything else, I'll leave you to make the call. The lad's violin is mentioned in the following paragraph. Section 7 is PL OK.
At 0.33-0.36: £1 9s. [I heard 7s.] 6d. I circuitously approach the topic of Barbara. The whole book has been delightful so far, but tonight I was laughing out loud. Thank you for recording this. This is a delight to listen to, and I'm sorry there are only two sections remaining. ...and try if smell of open air will remove smell of naphthaline. This has been such a pleasure to listen to. Thank you for letting me PL! Section 12 is PL OK, and beyond OK. The PL notes for the chapters I've marked are just things that I noticed because I was reading along. I don't think I would have commented on them if I'd being doing standard PL, so I'll leave it up to you to work out what, if anything, you'd like to alter. 6.25-ish: approach subject of burnt porridge circuitously and with utmost care. 10.29-ish: I circuitously approach the topic of Barbara. Left - triolet - I'm going to leave that one, as I wasn't sure either, and had looked it up at 'howjsay' It seems to be contested so ... French-ish it is. 13.56-ish: and try if smell of open air will remove smell of naphthaline. So funny that 'circuitously' turns out to be another one of those words I've gone my whole life saying incorrectly. Or, hopefully, not saying if I wasn't quite sure. Bravo! All PL OK. Your changes are seamless, too. This is a terrific book, and I'm very glad you chose it to record. I hope it finds many listeners all over the world, as it absolutely deserves it. Sorry for the delay, and congratulations to the finished reading! The cover for this project is ready since more than 3 months. It is uploaded. It seems no ones cares!! !